Hey y'all! Are you loving getting all of the fresh new fall ideas from Blog Hoppin'? I know I am! 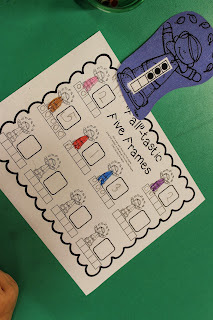 I'm here to show you some of the fun fall things we've been doing in our classroom the past couple of weeks! 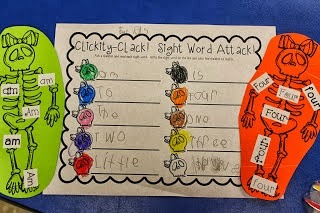 Fall is probably my favorite time of year so I like to bring the joys of the season right into my classroom through meaningful learning experiences. 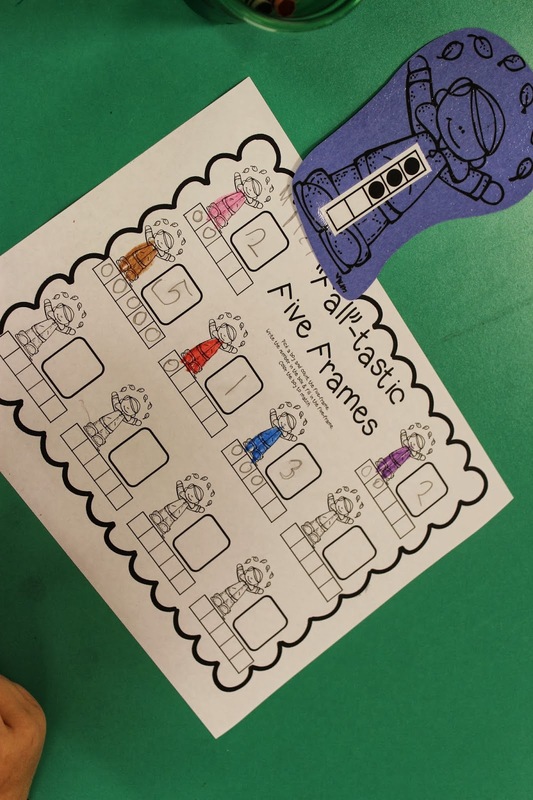 You can find all of these activities in one of these center packs: Fall-tastic Fun Centers, Apple Fun Unit, & Scarecrows, Spiders, & Skeletons Unit. 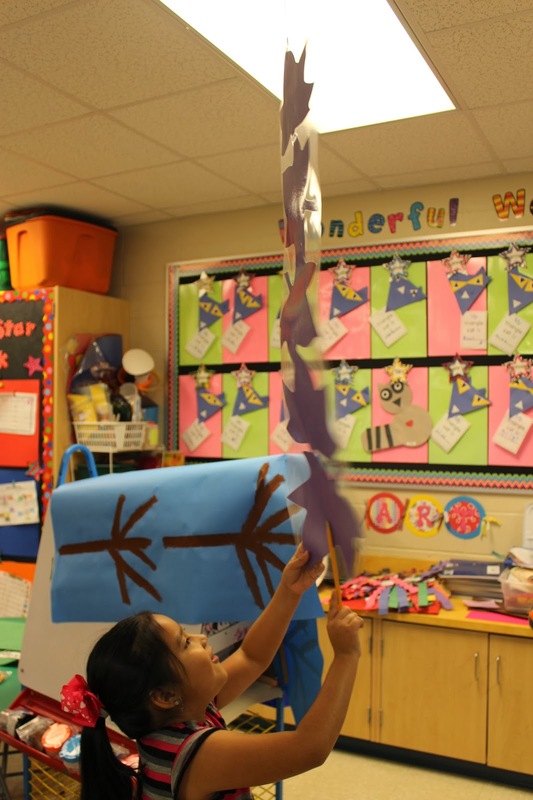 Here, students counted the leafy sets that were "falling" from the ceiling and recorded it on their paper. 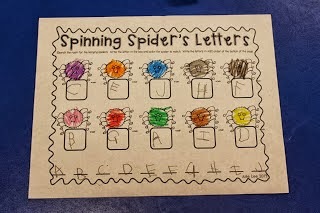 Number words can be tricky, but they are so much fun to learn if you get to use a cube, glue, and leaves! I love using real objects when I can such as the sorting baskets. It really makes the game engaging. 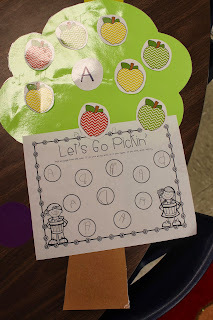 We picked apples from the tree and recorded the uppercase and lowercase letters. Vowels are so important and that's why we practice them every week...Which vowel Johnny Appleseed will make it to his pack and win?! 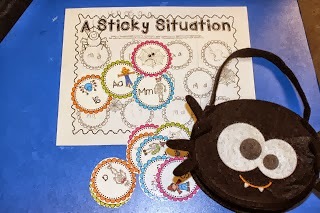 The spider bag came from Target and I knew it would be perfect for this grab and record game...but wait, if you pick a sticky web you lose a turn. 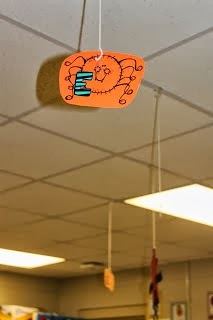 Another game where we find things hanging from the ceiling...The kids just love to be up and moving...since that what kids are best at! And, finally, I like that this game offers various fonts to read the sight words and the fact they have to read the word 6 times. Thanks for sharing all these fun station activities!!! Such great ideas for centers. So glad I found your page. Yay for being your newest Blog Lovin follower. Can't wait to see what else you share with us.